Several principles guide each and every Pilates exercise whether we use Pilates machines or a mat. Joseph Pilates did not mention these, but subsequent instructors have articulated them as a teaching aid. Here are the 6 commonly accepted principles – concentration, control, center (your core), fluidity (some say flow or efficiency of movement), precision, and breathing. I also describe a few more that you won’t find mentioned elsewhere, based upon my study and experience as well as discussion with one of Joe Pilates’ students, the ‘Pilates Elder’ Mary Bowen. First, we turn off the music and take off the earphones. At least in the beginning until we’ve developed some concentration. We also slow down all of our movement. The purpose of both is to pay more attention to what the body is doing and feeling. It’s a kind of mindfulness meditation. Keep your mind on what you’re doing, and when the mind wanders, gently return your attention to your movement and sensations. It doesn’t take long before your attention strengthens and wanders less. For example, when we roll up the spine many spots feel flat and inflexible, and many areas may not seem to have any feeling at all. I ask you to notice these areas. Pick one and play with it by pressing your spine against or into this tightness, flatness or numbness. This ‘play’ creates increasingly more flexibility and awareness of that area. Surprisingly, very soon you feel much more sensation and flexibility in that area. The seemingly impossible task of feeling each vertebra as you roll up and down your spine is within reach! This attention to the body is also the best defense against injury. If it hurts or feels frustrating we back off and take it slower or try a variation. No longer are we throwing our limbs with harsh, rushed or jerky movements. Controlled movement is healthier for the joints, and it’s much more difficult because it reduces a type of movement called momentum where little or no muscle is involved. Joseph Pilates originally called his exercises ‘Contrology’ indicating the supreme importance of controlled mind and movement. An additional benefit of controlled movement is the reduced risk of injury. Perhaps the greatest of the many contributions that Pilates made to the fitness world is his understanding of the muscles in the ‘center’ of the body. Every Pilates exercise strengthens one or more of the many muscle groups that surround our midsection. Pilates teachers call this area of the body the ‘core,’ ‘center’ or ‘powerhouse.’ Pilates was the first to realize that there are several muscles in this area that are ignored by other fitness programs – the inner abdominal muscles, the inner obliques and the iliopsoas. He also discovered that when these neglected muscles are strengthened everything changes! He devised simple yet very effective exercises that develop these muscles and additionally result in less reliance upon bulkier muscle groups such as the outer abdominal muscles and outer obliques. Consequently our bodies become leaner and stronger! Another advantage of Pilates is that you don’t need to understand anything about how your core muscles work or where they are located! Each exercise naturally and automatically strengthens your core. It’s particularly important for teachers to realize this, otherwise we overwhelm and frustrate beginners trying to identify and isolate muscle groups that are virtually non-existent at this early stage. As the core achieves strength at intermediate and advanced stages, identifying core muscles, proper alignment, and breathing patterns are much easier and for the most part automatic. By the intermediate series fluid movement is introduced. Increased awareness and control of your movement leads naturally to smoother and more efficient movement. It’s as beautiful to watch as it feels. By the advanced series this fluidity extends to the transitions from exercise to exercise so your entire routine is one continuous and fluid motion without pause. This in turn leads to an aerobic workout where your heart rate is elevated to your target rate for your entire 30-minute routine. At least 20 minutes a day of aerobic exercise is recommended by fitness research. Although we slow down our movement at the beginning stage, our goal is a ‘brisk’ pace that’s not too slow as to be tedious, but also not too fast as to lose our concentration and awareness. This fluidity brings grace and joy to all of our movement whether we’re exercising or simply walking, sitting and standing. In our advanced lessons, we introduce precise movement. The purpose is simple – the straighter our legs, or the more flexed our feet, or the longer we reach our arms in each exercise, the more stretch we achieve. This is a distinctive kind of stretching which is known in exercise science as ‘dynamic stretching’. Once again recent research confirms what Pilates has claimed for nearly one hundred years, that ‘dynamic stretching’ is safer and more effective than ‘static stretching’ found in nearly any other kind of stretching routine including yoga. The advanced lessons combine precision with fluid and controlled movement as well as sustained attention for a complete integration of mind and body – it is really quite thrilling. Each exercise has a breathing pattern based upon the natural rhythm of the lungs which is to exhale on the exertion. Joseph Pilates always emphasized the importance of breathing. In fact, my teacher Mary Bowen who was taught by Pilates remembers him saying that there are only 2 things he required of every student, that they learn the exercises and learn to breathe. In the beginning stage of learning the form, the challenge is simply to remember to breath at all! Our breathing throughout the day and especially when we’re learning something, is often shallow. This is why Joseph Pilates emphasized full breathing. For an new take on Pilates breathing click here. Breathing patterns are gradually introduced so as not to be overwhelming. Once you begin to feel comfortable with the form, breathing becomes relaxed, deep and rhythmic. This is why you feel exhilarated rather than exhausted at the end of a Pilates routine. And with a firm core, breathing naturally shifts from the belly to the chest. This is not to say that belly breathing is bad. Not at all. It is simply that when the core is firm chest breathing or what many Pilates instructors refer to as ‘lateral breathing‘ is easier than belly breathing. She explained that what he meant was that everything in Pilates increases strength, flexibility and awareness of the entire body. In other words, what the rest of the body is doing while you lift and lower your leg – your straight arms pressing into the mat, your “long neck” aligned with your spine, your breathing coordinated with your movement, and on and on – is equally important. The mind begins the process of connecting heretofore unconnected and unknown parts of our body. It starts with concentration. This mental focus soon leads to physical sensations of connectedness. For instance, the neck begins to feel connected to the rest of the spine, our extremities begin to feel connected in a long strong line to our core, and so on. The body in turn increases our awareness by engaging our attention and interest in its secrets: a new position of my feet when I stand feels more comfortable, a long neck when I drive feels so much better, and so forth. Pilates mat exercise is one of the few methods that combines all 3 of the essential exercises that the body needs to be healthy – stretching, strength training and cardiovascular conditioning. It’s important to understand something about strength training in particular. The goal in strength training is to fatigue muscle which means that the muscle is so tired or week that it shakes or you simply can’t do another repetition. This is how muscle becomes stronger. At the point of fatigue muscle brakes down! It actually tears apart, and when it heals which typically takes 24 hours – this is the pain in your abdomen – muscle tissue builds which results in more strength. If any of your core muscles hurt, allow yourself a day for the muscle to recover. Other exercise is fine such as stretching and aerobics, but not strength training. 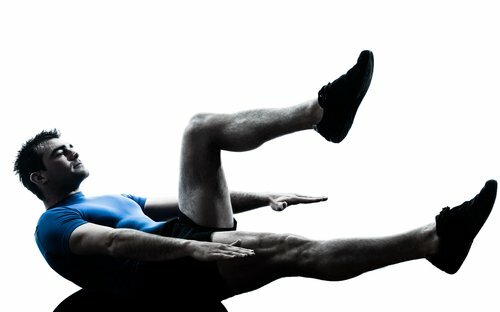 Pilates mat exercise typically suggests 3-5 reps of each position except the first one, ‘The 100.’ But feel free to play! This is an excellent way to fight boredom and periodicity. Periodicity refers to the fact that your muscles get accustomed to whatever exercise you do on a regular basis, and thus to continue to get stronger you must create variety in your workout. 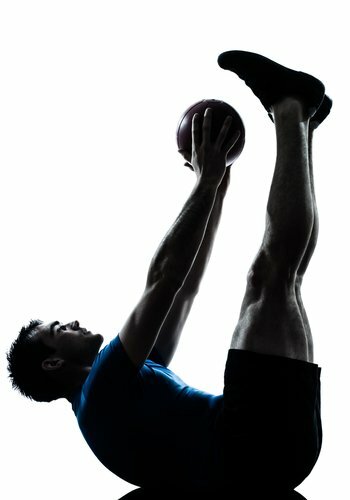 You can do this in several ways such as more reps, slower movement, changing the order of the exercises or adding props such as bands, rings, balls and weights to mention a few. I believe Pilates actually recognized this relatively recent discovery in exercise science, when he removing the metal rings from wine casks to create the first ‘magic circle,’ a device often used in Pilates exercises to add more muscle resistance and challenge. When your core is strong you carry yourself differently even outside the exercise room. Movement originating from your core feels effortless and graceful. When standing in line I find myself standing taller and preferring to stand on both feet aligned in my ‘Pilates stance’ rather than the usual one legged stance. I like to walk and swing my arms rather than carry something – it just feels better. When driving my car or sitting at a desk, I find myself reaching my head up for a ‘long neck’ – it just feels good! Proper alignment starts with the first beginner exercise when we introduce 2 simple techniques. First, we ask you to feel a ‘long neck’ by imaging that a rope is attached to the crown of your head (not the forehead) and someone is pulling you up by that rope like a puppet. The spine lengthens, the chin slightly dips, and you immediately feel like a soldier at attention! Though it often feels unnatural at first, this simple instruction actually connects your neck with the rest of your spine in a way we rarely allow for a natural and healthy alignment of the spine. Next I ask you to find your natural stance. For most of us this means the feet are in a slight ‘V.’ Maybe the heals touch. For some the feet are parallel. Whatever feels natural which is different for each person. We use these two alignment ‘principles’ in every exercise whether standing, sitting or lying on our back or side. This natural position of both the feet and spine soon becomes automatic. Alignment insures safe and healthy joint movement. We begin to discover that one side of our body is typically stronger or more flexible than the other, and with this discovery we begin to restore balance and equilibrium. Warming up is important before any exercise including Pilates. The very first mat exercise, known as ‘The 100,’ was specifically designed by Pilates to be a warm up exercise. I add more in Beginner Lessons just to be safe. We use ‘The 100’ for a warm up in the Intermediate and Advanced Lessons. Research shows that warming up before exercise is your best defense against injury. Interestingly, research also shows that stretching is of no value as a warm up exercise. If it hurts don’t do it! No more ignoring pain. Pilates understood that you do not need to fight your body to get strong and healthy. This attitude will make your body last longer, reduce the risk of injury, and make exercise enjoyable. We learn the all-important difference between the good pain of muscle building and stretching, and the damaging pain that says, ‘Stop, this is harmful!’ When something says stop, we listen and explore the many variations of each exercise. Sometimes it’s just a matter of trusting your body – what you can’t do today may be no problem tomorrow! 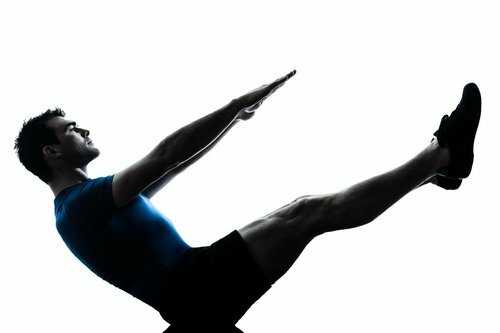 Pilates developed mat exercises nearly a century ago! It has passed the test of time. All of these Pilates principles have been proven safe and sound. He was a true genius – the Einstein of the fitness world. This is why elite athletes – from hockey players to dancers, wrestlers to racecar drivers and equestrians to golfers now include Pilates in their conditioning program.